Hi everyone! It’s getting hot here, and I’m so glad that my husband picked us up an above-ground pool – my hot self will be so happy to soak in that cool water! How are you coping with the heat (if you have any where you are)? Today is just a quick review of KBShimmer Urban Camo, “a multi-chrome that shifts from a pretty pistachio green, to a bright green, to silver, to a soft pink almost lavender color.” I wasn’t able to capture the full range of the shift in my photos, unfortunately, but you can see quite the shift in the bottle above. I’ve used 3 thin coats with top coat for my photos. I just wish I would’ve been able to capture more of the shift! Urban Camo is still available at KBShimmer.com for $8.75. I’m still not completely sold on multi-chromes – but I keep buying them in the hopes I’ll change my mind. LOL! Have you found any multi-chrome polishes that you love and would recommend? Your swatches of this look awesome! Maybe I need to try wearing this one on its own, because I wasn’t a huge fan of it layered over black. I didn’t even think to try over black, tbh. haha! What a great shade! My wish list of kb shimmer shades is getting longer and longer! This is such a gorgeous complex shade! I love the look of this polish. It is very reptilian. 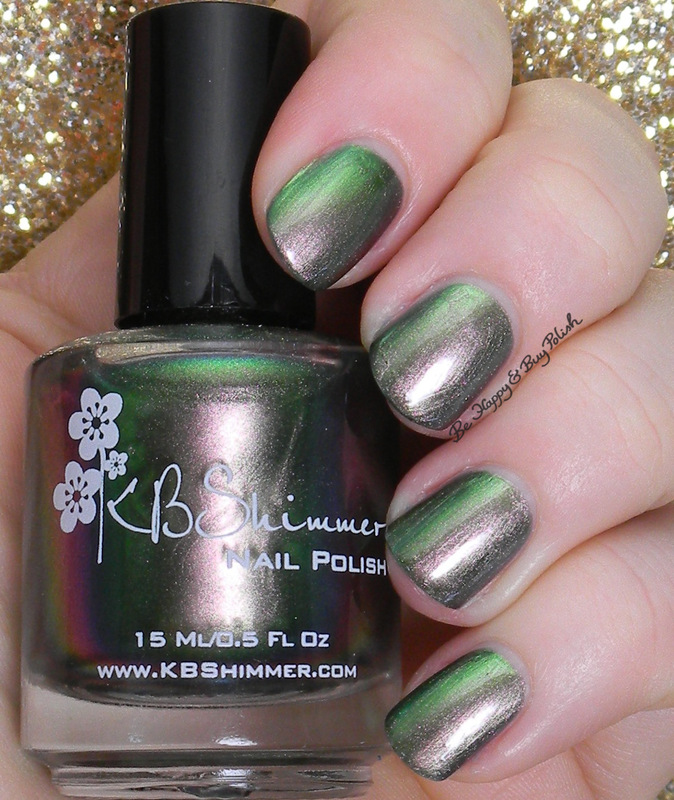 KB Shimmer just never gets it wrong. This multichrome is just dazzling. This shade looks super cool. Not sure if I would wear it since I’m not a huge fan of these types of polishes, but I like how much it shifts! This is a stunner! I love duo chrome polishes! I love multi-chromes!! I’d love that polish. I feel like I’m watching a movie on my hands when I wear shades like that. I feel the same way. I like the idea of them, but they never end up wowing me. Wow! What a gorgeous color! !